heya, welcome to the forums. curiously i was just watching arthur clarke describing the mandelbrot set in "fractals - the colors of infinity"
there doesn't seem to be a direct 3d analogue of the mandelbrot set. you can spin it about the x axis, you can use the same kind of iteration using quaternions, and a whole bunch of other "nartural" extensions ... but in the end the character of the original mandelbrot set is lost. Even if it wasn't like a 3D rendition of the Mandelbrot, I would love to know of a 3D fractal that has mandelbrot-type beauty and complexity along with the amazing variety. As far as I know, no such fractal exists, but perhaps I haven't looked hard enough? I've just spent an exhausting week trying to create a TRUE 3D rendition of the Mandelbrot (or whatever the equivalent would turn out to be). It's been a really cumbersome, if somewhat exciting journey. Although you say we should be happy with the 2D version (which I am), I believe that maths can do anything, and that it's just a matter of finding the right equations to find the jackpot. To aid me in my quest for 3D perfection, I have tried to use 3 dimensional numbers, and have even creating my own arithmetic around it. At first I was meddling with the basic 2D formula, but trying to mould it into 3D dimensions using simple algebra (expand the equation and simplify). This leads on to questions such as what you would do if faced with i multiplied by j (j being the 3 dimensional imaginary number). Using solutions based around this approach I got some interesting extruded/distorted 3D Mandelbrot objects, but nothing like what I was hoping for (where the Mandel-type detail is surfacing throughout all 3 dimensions). Failing that, I also tried to visualize what happens in standard complex multiplications, and used rotation techniques, but in all 3 dimenions, instead of the 2D rotation for complex numbers. In the end, I got another "extruded Mandelbrot" which had a sort of bird shape at one cross section of the 3D object. It was quite interesting, but nothing sensational. Still it was quite fun too. If anyone has any inkling whether 3D mandelbrots could even theoretically be possible, I would love to hear. You could probably get what you're aiming for by performing fancy transforms on 3D/4D space prior to plugging coords into quaternionic iteration, though you might consider that as "cheating"
(except that's mostly self-similar, so it's good but no cigar). I know standard quaternionics is no use, but to go back to 2D, you could apply a 2D manipulation of the complex plane (i.e. x and y coords) prior to plugging them into the standard z^2+c iteration to (for example) give the Mandelbrot an extra lobe - or remove a lobe. In the same way you could manipulate 3D/4D space prior to plugging the coords into a quaternionic iteration (for "roundy" results) or a hypercomplex iteration (for "squarey" results) to produce 3D lobes. As you say though I've seen no-one try this yet In fact I've never seen any 3D/4D fractal software that allows 3D/4D transformations to be applied in that way (i.e. like UXFs are used for 2D in Ultrafractal). Wow, sounds good. Seriously, if you see any picture on the net, then please let us know ASAP! 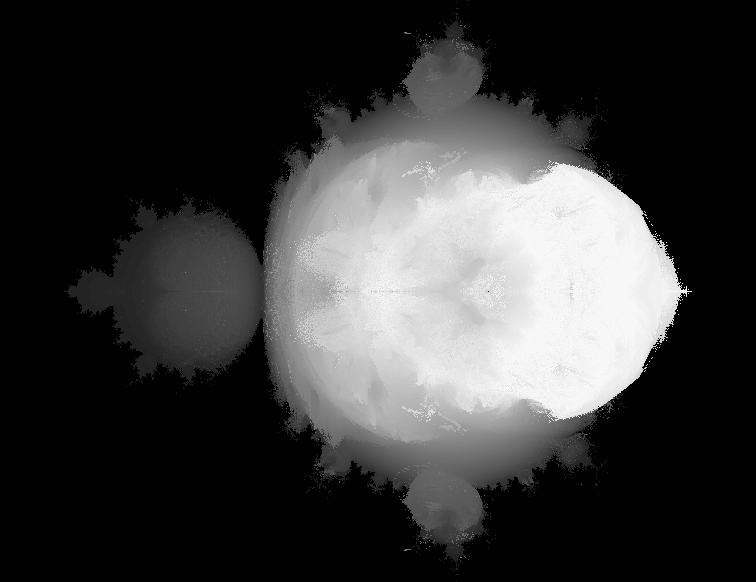 So far, this is the closest I've come to creating a 3D-style mandelbrot with bulbs on all axis. It uses techniques described in my "Meet & greet" forum thread, and orthographic projection with lighter areas at the front. Sigh, so close, yet so far! hey that's looking promising, email me the cayley table you used and i'll ray trace it - busy working on the program now after my horrible exam earlier today. Thanks for doing this. It's gonna be quite exciting to see how it all turns out! This is cool, I'll be watching this thread. heya, thanks for the formulae just popping in to say that i'm writing my last exam for this year tomorrow, and it's a killer so there's going to be at least a 1-day lag until i implement this... oh, and you can cancel the square root / squaring for big speed gains and increased numeric stability. i also think it's possible to simplify the iteration a LOT. i'm going to fix the iteration now (and also try out the "julia" version, where the constant isn't the initial point) and render it a bit while i do the algebra/trig on paper to simplify the equations.